I’ve attached a guide that outlines general best practices with Smart Data Access. Please have a look as it’s a great resource! There have been a lot of updates to Smart Data Access and a lot of bugs have been fixed in newer revisions. How to raised queries & How to get Solutions. Pl. suggest me. Where we have to see ans. i just started using MSSQL Remote Sources. Virtual Tables are working well and i am also able to preview data. I found some similar issues on SAP Crystal Report. As i understood, joins/unions are supported my SDA. The issue seems to be that it is not possible to fire multiple selectes inside one connection. Is this a known issue? Is there a specific connection pram for unix odbc connection to avoid this? Sadly this is not the whole story because under SP82 there are some issues that crash the complete HANA Stack! There is a crash dump concerning SQL Bind and OdbcAccess and federation! The normal calls via SQL script are working fine, but my calculation views with JOINS crashed our HANA instance. I will retry after upgrading to SP85. Can you share best practices around usage of SDA? For ex: Data Volume restrictions, Data transformations limitations etc. I am trying to connect to Teradata. Extra Adapater Properties is a mandatory field. I have no idea and did not find any details about this. Can you please help and guide. Adjust the connection mode to “Data Source Name” and then this remote connection can be created. Its giving odbc error now. Working with my Basis team to get drivers checked on server side. Is it possible to consume a modeled view via Virtual Connection? ie: instead of table create a virtual connection to “_SYS_BIC”.”VIEWNAME”? I’m experimenting with this and getting Error opening the cursor for the remote database. So I’m tinkering with authorizations however in the back of my mind I’m wondering if it’s because it’s not possible. 1) The remote source is also HANA. 2) There is a view created on the remote source. 3) On the primary system you create a virtual table from “_SYS_BIC”.”VIEWNAME” and then create a view from it. What revision are you using ? You have it exactly right except step 3 we are not creating a view yet, just trying to do data preview on the virtual table at this point. And on step 4 it fails with the cursor error. We are on 82 and 85. You can perform data preview on virtual tables. But is this virtual table can only be created from the tables and views from _SYS_BIC. Do you get the cursor error with every single table in the remote source? Ok I’m going to create a separate post and include you so you get proper credit for helping me out and we can continue the discussion. This is a really neat piece of work – thanks for that to the Canadian team! The only think I wonder is, why this is not a document instead of a blog post? The Difference between a Discussion, Blog Post, Document and Wiki gives good guidance here and personally I think this really would make a great reference document. while trying to load data Through SDA from SAP hana to Oracle tables, we are facing an issue w.r.t date columns. created an virtual table vt_test in sap hana. Could not execute ‘INSERT INTO VT_TEST(A,B) (SELECT a,b FROM test)’ in 259 ms 615 µs . I think there are some differences between the formats between Oracle and HANA. If you are inserting DIRECTLY into Oracle, what is the insert statement you use? From there, we may be able to determine the differences between that statement and the one HANA is trying to send to Oracle. this is working fine at oracle end. i have noticed datatype for date column changed to timestamp when created virtual table using below statement. Can you create an incident with SAP Support on this? I think the issue could be related to the changing of the datatype to timestamp when the virtual table is created. Nice Jimmy 🙂 , thanks for this! I’m linking from one HANA system to another HANA system via SDA. I can see my virtual tables and can even see the data if I query the virtual table. I’ve also managed to create a calculation view from one of the virtual tables and it saves and activates successfully. However, when I then do a display data preview or query the view I get the following error: SAP DBTech JDBC: : Insufficient privilage . If I change my view properties so that “Apply Privilages” is on Blank or on “Anlytical Privilages” instead of the “SQL Analytical Privilages” I then get a No Values message returned to me when I do the data preview or query. You are getting the DBTech JDBC: : Insufficient privileges error because the user you are using does not have the correct privileges. Please see this authorisations troubleshooting guide to check which privileges you are missing. Thanks for the prompt reply Michael. I’ve had a look and cant seem to pin point the privilege(s) that are missing. Will keep you posted. I managed to get it sorted out by changing the view properties “Default Client” setting from “session client” to “cross client”. I am new to SAP and Hana, so this may be a easy question. 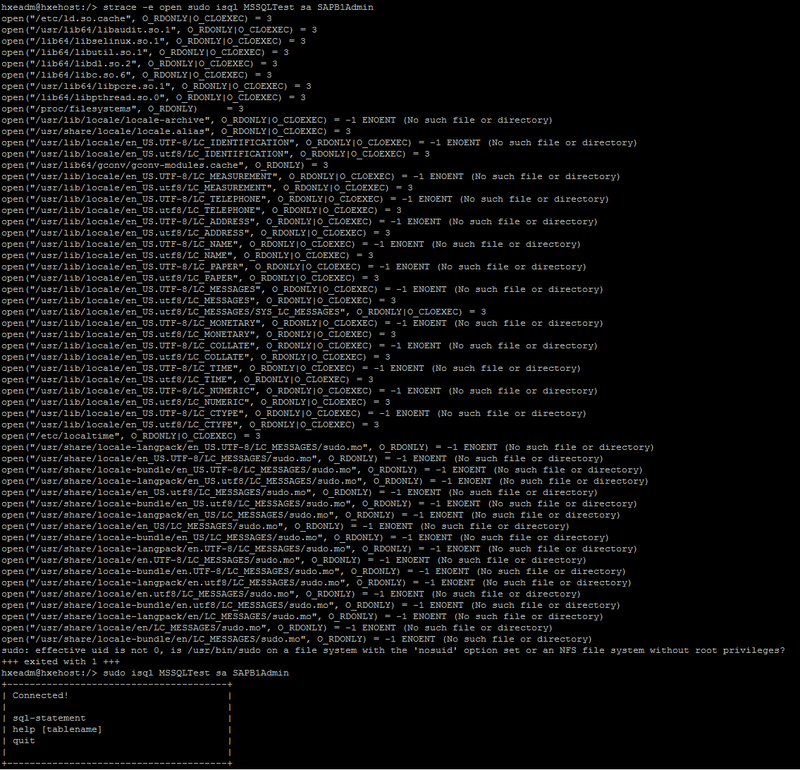 I am loading hana table via SDA , from Oracle. When my Oracle View has ‘ ‘(space) in a field, the result in the Hana table is ”(no space). Is this just the way it works? I have tried looking up this issue though to no avail. Any documentation you could point me to would be greatly appreciated. I can prove this out just doing simple counts on the view or table when the field is =” or =’ ‘. The space is missing in the Hana table, yet I see the space in the Oracle View. I think I may be on to something, so here it is. The SDA defines the column in question as Char (1) whereas I define the Hana table to varchar(60). I am wondering if that conversion is what is leading me to nothing in the Hana table. With that, is there any way to change the definition SQL Data Type of a column in the SDA? Thank you for your time. Just thought I would give you an update. By using the cast() functionality in Oracle on the Oracle View I was able to resolve my issue. This cast() forces the SDA to behave differently. I’m working with SDA on MSSQL and I was able to create remote data source and on hana system as root I’m able to access DSN correctly and run test SELECT cmd and get table. Anyway on Hana Studio on the remote data source which give all ok on connection once I expand it I got the DB name I expect and as well che schema dbo, but than if I expand at that point no table at all are listed so that I can’t create virtual table. I suspect you are encountering a bug that is resolved in revision 111. The bug is related to the GET_REMOTE_SOURCE_OBJECT_TREE procedure. To fix this issue, you should upgrade the HANA system to 111 or higher. Also upgrade Studio as well. The workaround is to use an older version of HANA Studio. If you use a SPS08 level Studio these tables should appear. Hello Jimmy, hana update solved the issue. I have enabled SDA connection between HANA DB and Sybase IQ. I’m getting the below error. Sometimes connections seems to work fine and sometimes getting below error. I apologize for the delay. Are you able to isql into the IQ system? Please use the exact same DSN as you were using in IQ as well. Hi Jimmy – Indexserver of Master blade was restarted which caused connection issues between HANA and IQ in SDA. After we did complete HANA restart the connection works fine now. Thanks for your reply. What is the promotion process for SDA table? If SDA is setup in production system, do we need to do import and export method or as an one time activity we need to do manually? From SQL statement, remote source look as follows. Have you facing problem same with me? From my understanding, MySQL is not a supported remote data source with Smart Data Access. That is why it’s giving you that error. SDI is essentially next generation SDA so that may be a better option for you in the future. When I add a sql server table as virtual table, I get the following error. This is because the column in sql server is defined as varchar(max) and Hana not able to convert. Is this limiration in SDA or any one has suggestions to add any options to resolve this. I am using HANA Express VM and trying to establish SDA connection to MSSQL Database. However, I am able to connect to MS SQL via isql, and I can query the SQL database through the isql commands. 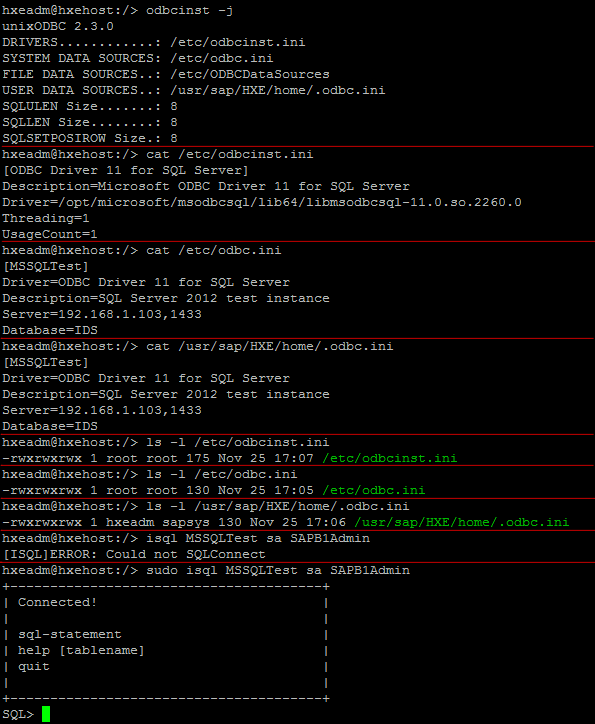 I suspect the issue is the HANA system is using a different odbc.ini file than isql is. On the other hand, isql uses /usr/local/etc/odbc.ini by default. What you should do is set the ODBCINI EXPLICITLY to $HOME/.odbc.ini, that way, both HANA and isql will use the same one. You can do this by adding an entry into the HANA <sid>adm’s profile file (.sapenv.sh or .sapenv.csh). Thank you for your response. I am using the hanadb user (which is created by default from SAP-delived VM) in suse linux to connect to MS SQL which is on windows 7 box. First I was unable to even open odbc and odbcinst files from hana db user, then I logged in as root user and gave all the read/write/execute permission to these .ini files. Then i was able to connect. 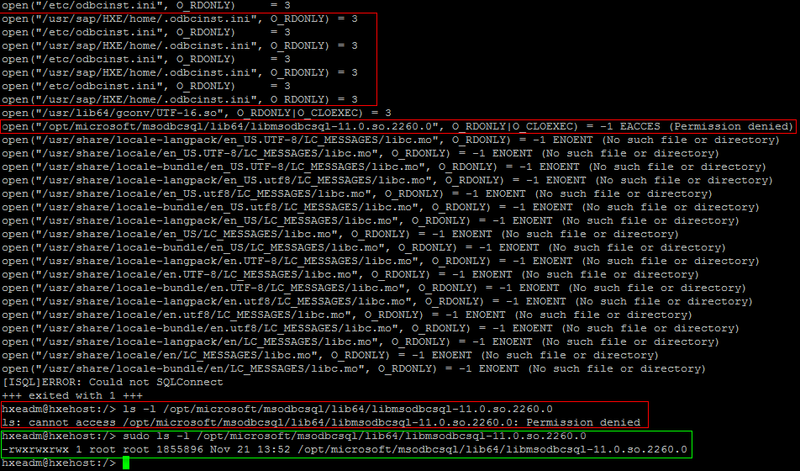 I have attache three images to show you all my configuration of unixodbc and paths to drivers. when I run strace (as hana user), I can see the permission denied error on Microsoft odbc driver file (attached image no. 02), even though I have granted full permission on this file. I have also given in here the strace of isql while connecting to MSSQL both with and without using sudo. Please take a look and guide me where should I go from here? I am very new to this linux and hana, this is the first time I am using linux. For the past two weeks, I am just wandering around searching for the solution. Hoping to see this solved this time around. The first error you had is not descriptive enough to give you something to act on. You should add a -v to give you a more verbose error. I’m just curious what that error message will be, but it looks like it is something with permissions. The fact that you sudo into root, and then it works, may indicate more of an issue with dependent libraries, not the libmsodbcsql-11.0.so.2260.0 library directly. Thank you for your followup. I ran ” isql -v MSSQLTest sa SAPB1Admin ” and ” ldd libmsodbcsql-11.0.so.2260.0 ” and also ” sudo ldd libmsodbcsql-11.0.so.2260.0 “. Result are attached. Permission seems to be the reason. I also tried relocation libmsodbcsql-11.0.so.2260.0 to $HOME and other places, it gives the same error of permission denied. What should I do now? Once again I appreciate your support. Even if you grant 777 on the library alone, if the directory doesn’t have the permissions, then the behavior would be what you are experiencing. Jimmy you are a life saver! sudo chmod -R 777 /opt/microsoft worked. Successfully established SAD connection to MSSQL. I can now create virtual tables and query the MSSQL from HANA Studio. Earlier I was granting 777 on only libmsodbcsql-11.0.so.2260.0 and was failing every time I tried to make a connection. I posted my this issue on 5 different blogs, on youtube also, but only you resolved this. Thank you very much man. I owe you this! Thanks for the great blog Jimmy, I have performance question. I’m not an expert in SDA performance, but I believe there are some elements of the remote source that is processed on the HANA end and some still on the remote source. So performance can vary. I am trying out similar SDA from Hive tables. I could able to create remote source and view the tables. But while adding any table as virtual table am getting the following error. Following SAP note 2396577 I tried adding virtual table via SQL. Still its giving the same error. I have setup Microsoft SQL 2012 database Remote Data Source in HANA 1.00.122.08 also able to create virtual tables in HANA schema and accessing MS SQL data in SAP BW on HANA without any issues however when any Table or View definition is modified i.e. Field addition or modification is done in Microsoft SQL 2012 Database i am not getting changes in HANA remote data source tables or in Virtual tables. How can i get the MS SQL Table / View definition in HANA remote data source table and then in Virtual tables in HANA schema. I don’t think the ability to view the remote data sources’ table definition exists. You can view the virtual table definition in HANA Studio by right clicking the virtual table and selecting Open Definition. An already installed component SAP Hana Smart Data Access is not compatible with SAP Hana DB version 1.00.102.4. Sap Hana SDA requires SAP Hana DB version 1.00.110 and greater. I am unable to install any server component, it just keeps going back to the prompt. You will probably wonder why I am not going to a higher version of Hana. The problem is that the previous Basis guy installed PRD & QAS with 1.00.102.04 but left DEV on 1.00.102.02. Also it’s the same version of SDA on all 3 systems. How do I bypass this message and able to carry on with installation. Should I uninstall SDA and reinstall after the update? Or is there another method. Let me confirm a few thing with you. Also, how are you installing Smart Data Access? Are you simply running install.sh? I resolved our problem. Let me explain. We have a BI Landscape PRD QAS DEV. What happened is that whoever installed Hana BI & SDA had PRD/QAS on 1.00.102.04 while DEV was on 1.00.102.02. We needed to refresh DEV from PRD but was unable because the maintenance revision differed. So we attempted to upgrade DEV to 1.00.102.04. ./hdblcm –ignore gave us the same error. Sap Hana Smart Data Access requires SAP Hana DB version 1.00.110 and greater. These are the Components we needed to upgrade.